The USS RONALD REAGAN (CVN-76) keel was laid on 12 February 1998 at Northrop Grummans Newport News Ship Building and Dry Dock in Newport News, Virgina. Three years later, on 4 March 2001 she was launched with sponsor Mrs. Ronald (Nancy) Reagan presiding. Five years and five months after her keel was laid, USS Ronald Reagan was commissioned on 12 July 2003 with Captain Bill Goodwin in Command. Named for Ronald Wilson Reagan, she was the first US aircraft carrier named for a living person. Ronald Reagan, the 40th President of the United States of America, died on June 5, 2004. In November 1980 when President Reagan was elected, the Soviets were in Afghanistan, the Hostages were captive in Iran and the United States economy was suffering from the ravages of stag-flation. As the 1980s progressed, the economy revived providing the strength to rebuild the US Navy and military, from its post-Viet Nam malaise, and eventually bring about the collapse of the Berlin Wall and the Soviet Cold War threat. Revival of the US military and power in the 1980s provided the infrastructure to oust Saddam Husseins Iraqi Army from Kuwait in 1991. Ronald Reagan is a Nimitz class nuclear powered aircraft carrier. USS Ronald Reagan is the ninth of the ten ship Nimitiz class. She will be followed by the USS George H.W. Bush (CVN-77). A new class, beginning with USS Gerald R. Ford (CVN-78)will be built thereafter. The Nimitz class of aircraft carriers are built with an intended fifty year service life. USS Ronald Reagan should be ready to defend the United States until the 2050s. After commissioning, sea trials and final construction details finalized, USS Ronald Reagan set sail from Hampton Roads, Virgina, for her new home port of San Diego, California. Too large to pass through the Panama Canal, Ronald Reagan rounded Cape Horn, at the southern tip of South American, in June 2004. She worked here way north along the western coast of South America calling on Valparaiso, Chile; Callao, Peru; then on 23 July 2004 arriving in San Diego. 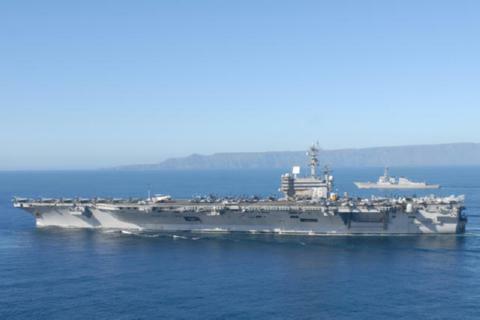 USS Ronald Reagan made her maiden voyage in January 2006 in support of Operations Iraqi Freedom and Enduring Freedom and provide added security in the Persian Gulf region. She returned to San Diego in July 2006. Upon her return to San Diego, she was called upon to perform an unscheduled surge deployment as part of the Navys Fleet Response Plan. USS Kitty Hawk needed relieved from her forward deployed station in Japan for critical maintenance. USS Ronld Reagan was again deployed to the Western Pacific in January 2007, standing Kitty Hawks watch until USS Kitty Hawk returned to duty in april 2007..
USS Ronald Reagan provided emergency assistance to a cruise ship in the waters off Baja California 15 December 2007. A 14 year-old girl from Illinois aboard the SS Dawn Princess, experiencing abdominal pains, was helicoptered to USS Reagan. The USS Reagan surgeon performed an emergency appendectomy in the aircraft carriers Sick Bay. In May 2008 USS Ronald Reagan deployed for her third Pacific deployment. During June and July she participated in a humanitarian mission to the Philippines in response to Typhoon Fengshen. The Ronald Reagan Strike Group, which included USS Chancellorsville (CG 62), USS Decatur (DDG 73), USS Gridley (DDG 101)and USS Thach (FFG 43) provided 250 tons of provisions to devastated area of Panay. Proceeding on to the Indian Ocean, USS Ronald Reagan supported the effort of Operation Enduring Freedom in Afghanistan. Ronald Reagan returned to home in November 2008. May 2009 saw USS Ronald Reagan deploy to the Far East for the fourth time. She relieved USS Eisenhower in the ongoing Operation Enduring Freedom effort in Afghanistan. After five months deployed, Ronald Reagan returned to San Diego on October 21, 2009. During routine operations off the coast of Florida in December 2010, USS Ronald Reagan came to the assistance of SS Carnival Splendor. Carnival Splendor was dead in the water after a fire in an engineering space disabled her. Ronald Reagan stood by, lending any needed aid, until the U.S. Coast Guard Cutter Morgenthau relieved her..
JUN 2008 - JUL 2008 REAGAN Strike Group leaves 108 sailors in Hong Kong.